Bauhinia purpurea is a species of flowering plant in the family Fabaceae, native to South China (which includes Hong Kong) and southeastern Asia. In the United States of America, the tree grows in Hawaii, coastal California, southern Texas, and southwest Florida. 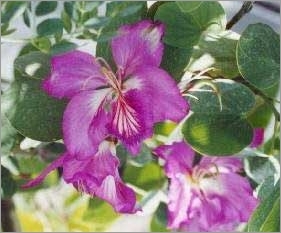 Common names include Hong Kong Orchid Tree, Purple camel's foot, and Hawaiian orchid tree. It is a small to medium-sized deciduous tree growing to 17 m tall. 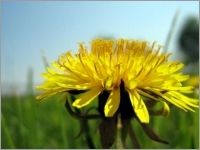 The leaves are 10-20 cm long and broad, rounded, and bilobed at the base and apex. The flowers are conspicuous, pink and fragrant, with five petals. The fruit is a pod 30 cm long, containing 12 to 16 seeds.